Strong-Ty™ Kynar® cable ties are ideal for severe environments where combinations of high temperature, corrosion, UV radiation and mechanical stresses lead to rapid failure of commodity plastics such as polyamide (nylon), polyethylene or polypropylene. Unlike these common plastics, Kynar® PVDF will not ignite and burn in normal atmospheric conditions and does not generate smoke. These properties allow Strong-Ty™ cable ties to meet the National Electrical Code (NFPA-70A) and UL94V-0 requirements for installation in building plenums. 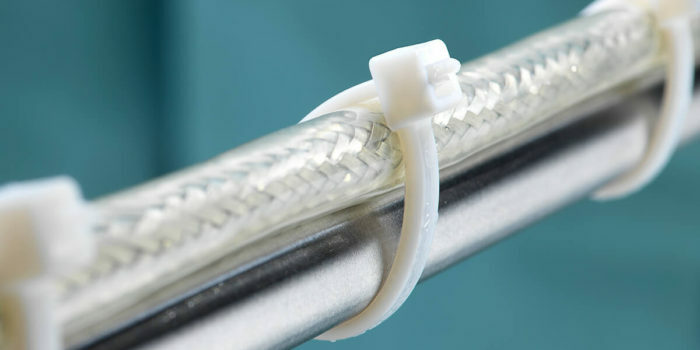 Material properties of PVDF allow the sterilization of Strong-Ty™ Kynar® cable ties by radiation, chemical or autoclave methods without loss of strength or flexibility. Designed with a flexible internal hinge and a curved tip, Strong-Ty™ cable ties are easy to use and provide consistent and reliable performance. Each injection-molded tie is individually identified so any performance variation can be tracked and corrected. All our Strong-Ty™ cable ties are available in natural unpigmented Kynar® PVDF. These cable ties are ideal for corrosive process applications where test data shows that exposure to chemicals such as hydrochloric, sulfuric and hydrofluoric acids result in no loss of physical properties. 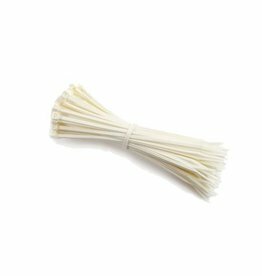 Excellent non-flammability properties and heat resistance make these cable ties a better choice for organizing wires, cables and hoses in plenum spaces, under the hood and in appliance and computer cabinet interiors. Strong-Ty™ cable ties are durable and resist abrasion and mechanical damage during and after installation. Strong-Ty™ High-Purity – manufactured and packaged inside a clean room according to ISO 13485 procedure and designed for use in biopharma and semiconductor environments and in the production of high-purity chemicals. Strong-Ty™ Industrial – made from Kynar® PVDF in a standard production environment, these cable ties are ideal for photovoltaic wire and cable management and chemical process applications. 3Dogg High Purity PVDF-Kynar® Kabelbinder 20cm/8"
High Purity PVDF-Kynar® Kabelbinder 20cm/8"